While government and industry have been slow to respond to the water contamination crisis in West Virginia, a wiki-style relief effort has formed to fill the gap. Last month, an estimated 10,000 gallons of the coal-processing chemical MCHM, along with an unknown amount of a second substance called PPH, spilled into West Virginia’s Elk River — just upstream from a municipal water intake that serves nine counties. Freedom Industries, the company responsible for the spill, neglected to report it, despite some residents claiming to have smelled the chemicals as far back as December. After repeated complaints of a strong licorice-like smell, state inspectors literally followed their noses to the source. It wasn’t until many hours later that the water company and government agencies finally warned residents to avoid any contact with water— aside from flushing toilets and putting out fires. In the seven weeks since the disaster that has left 300,000 people unsure about the safety of their water, confusion and anger have mounted, and an estimated 400 people have been sent to the hospital. While government and industry have been slow to respond to the needs of the people, some remarkable community organizing has taken place, drawing on West Virginia’s long, proud history of grassroots work for environmental and economic justice — including powerful work against the abuses of the chemical and coal industries responsible for the spill. 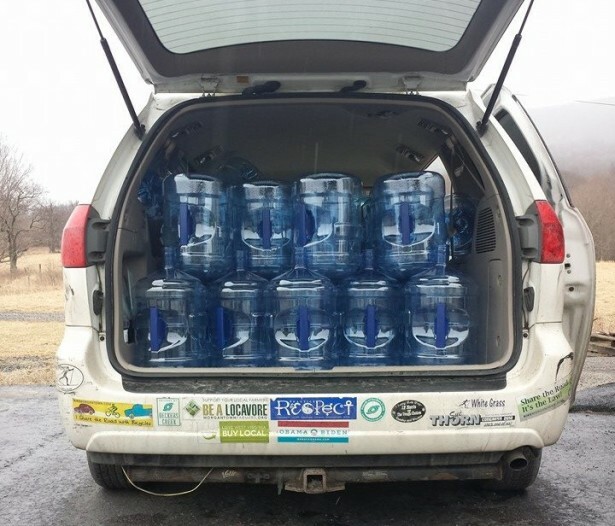 Only a few hours after news of the spill began trickling out, a grassroots group called WV Clean Water Hub had already begun organizing water deliveries through its Facebook page. That quickly turned into a massive community-organized effort supported by new volunteers, as well as long-established grassroots groups in West Virginia — including Aurora Lights, Coal River Mountain Watch, Keeper of the Mountains Foundation, Ohio Valley Environmental Coalition, and RAMPS. By working to identify communities in need of clean water and supplies, as well as connecting affected communities with volunteers and donors, this wiki-style relief effort has filled the gap left by larger relief organizations. In many communities, the water was officially declared safe for all but pregnant women within a week of the spill, but residents are still experiencing adverse reactions to touching or smelling the water coming from their taps. Some government officials recommend against exposure, while others just say to be cautious. The WV Clean Water Hub has been led largely by environmental groups, which can be a source of tension in communities that have been split by the “jobs vs. environment” myth perpetuated by the coal industry. However, the crisis has inspired many to ignore politics. For instance, landscaping companies have donated the use of their trucks, while schools, Girls Scouts, local unions, doctors’ offices and others have collected donations of water and baby supplies. While some volunteers have encountered a few sharp questions from self-identified “coal-huggers,” the reception has largely been warm. “Giving out water has been a way to connect on a personal level and share that we both are fed up by the government and no longer trust the people in charge,” May said. Beyond the massive effort to deliver clean water, there has been an unprecedented surge of interest in organizing for long-term solutions. One outcome of these new partnerships was a protest hosted by the NAACP and Ohio Valley Environmental Coalition, where hundreds of consumers reverse-billed the water company that serves the nine counties affected by the spill. While the West Virginia American Water Company might be seen as an unwitting victim of the spill, the international for-profit company’s blundering response has included sending tankers full of the polluted water into communities instead of usable relief water and providing only a $10 credit to customers and businesses. The action to recoup the costs of having to drive miles to collect drinking water, do laundry and take showers is just one of many examples of groups from different, often isolated areas of work coming together on this issue. In addition to the coordination of long-standing groups, there has also been an overwhelming amount of spontaneous community organizing, including the formation of a rainwater catchment organization, a moms for clean water group, various organizations of concerned small businesses, and even a fashion show to raise money for water deliveries. These diverse responses reflect the diversity of the communities that have been impacted. While the coal and chemical industry have caused toxic water in isolated rural areas for decades, this time, reporters covering the story, public health experts, and even Public Service Commission employees in charge of water regulation are all personally dealing with blue-tinted water that smells distinctly like licorice. According to Kunkel and others organizing in the area, the work has begun to focus on long-term goals over the last seven weeks, even as many organizers are exhausted with the toll of working at an emergency pace for weeks on end. Groups have outlined clear steps for politicians to take towards enforcement of the chemical and coal industry as well as beginning a campaign to engage the Public Service Commission, which regulates West Virginia American Water, to ensure that residents’ health is put before water company profits. Both experienced and new activists realize this is an important moment for West Virginia, and they are working to create long lasting momentum for change at the structural level. Dana Kuhnline has worked against mountaintop removal coal mining and other forms of extreme extraction since 2005. She loves healthy communities, clean water and great jokes. The plight still wages. Now there are schools where the students are being told to bring their own bottled water or use the tap, which, I’m sorry but my wife and I are still in the center of this mess there is still no end in sight. Regardless of what the officials say. If you think going through the proper channels to get to the people you already think are not worthy of being in charge, then you really are masochists I’m sad to say. The system will keep on bringing more of these problems down the pike. The fact that you have to fight for clean water shows the level of care of politicians and where health for their constituents comes in their list of priorities. DMW your comment made me chuckle a bit. What activist that wants justice in this world hasn’t woken up with that feeling? I don’t know if activists in WV would all identify as masochists, but they are pretty dang tough and definitely not naive about what they are up against. For me, when you love a place, the love for the beauty of a place and the great people who live there gives you hope to keep fighting to protect it. I don’t think people believe that their efforts will result in an instant overhaul of the disgustingly corrupt system that created the problem, but I’ve seen the proof that the creative and multi-pronged struggle for justice in Appalachia has won many real improvements for people.